All your files are important, and I'd strongly recommend backing up everything. Some of you may back up your documents, but it's best not to ignore an important part of your Mac's files: Your iTunes media. There may be a lot of money in your iTunes library, and a lot of time spent building it. After all, iTunes holds music, videos, and audiobooks that you've bought, as well as any CDs or DVDs that you've ripped. While you can replace the latter, if you lose your files, it would take a long time to get everything back. Now if you're short on space, there are some iTunes media files that you don't need to back up. Here's an overview of how to back up your iTunes media files, and which ones you need to back up. What's in your iTunes library? Each of these folders contains a specific type of file. 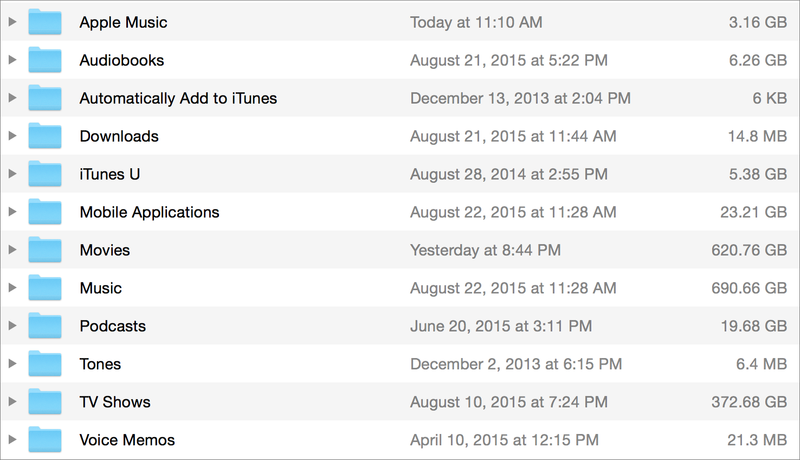 Two exceptions are the Automatically Add to iTunes folder, and the Downloads folder. The latter holds temporary files for iTunes downloads, and the former is a sort of watch folder that adds to iTunes any files you place in it. You could simply back up the entire iTunes Media folder, but if you're a bit short on space, you can exclude some of the content. Here's what you need to know about these folders. Apple Music: This folder contains music you've downloaded from Apple Music for offline listening, as well as a cache of music you've streamed. You can always re-download any of these files, so you don't need to back them up. Audiobooks: If you buy audiobooks from Audible, you can always re-download them, but this is not the case for audiobooks purchased from the iTunes Store. So back up your audiobooks if you do buy them from Apple. If you rip audiobooks yourself, then you need to back them up to, because it would take a long time to rip them again if you lose them. iTunes U: You can re-download this type of content from the iTunes Store at any time. Mobile Applications: These are iOS apps. You can always re-download them. Movies: If all the movies in your iTunes library come from the iTunes Store, you can always re-download them. If not, back them up. Music: You can re-download any purchased music from the iTunes Store, but you probably have lots of music you bought elsewhere, or ripped from CDs. Back this folder up. Podcasts: You can re-download this type of content from the iTunes Store at any time. Tones: This folder contains ringtones or alert tones. If you've bought any from the iTunes Store, you cannot re-download them, so make sure to back them up. TV Shows: Just like movies, you can re-download ones purchased from the iTunes Store, but if you've ripped your own DVDs, you need to back these up. Voice Memos: These are voice memos you've recorded on your iOS devices. Back them up. There are two easy ways to do this. The first is to use Time Machine, which we've discussed here. Just connect a hard drive to your Mac, and set it up. It's automatic and transparent. Time Machine backs up your files every hour, and keeps old backups, so you can always be sure to find any files you've lost. 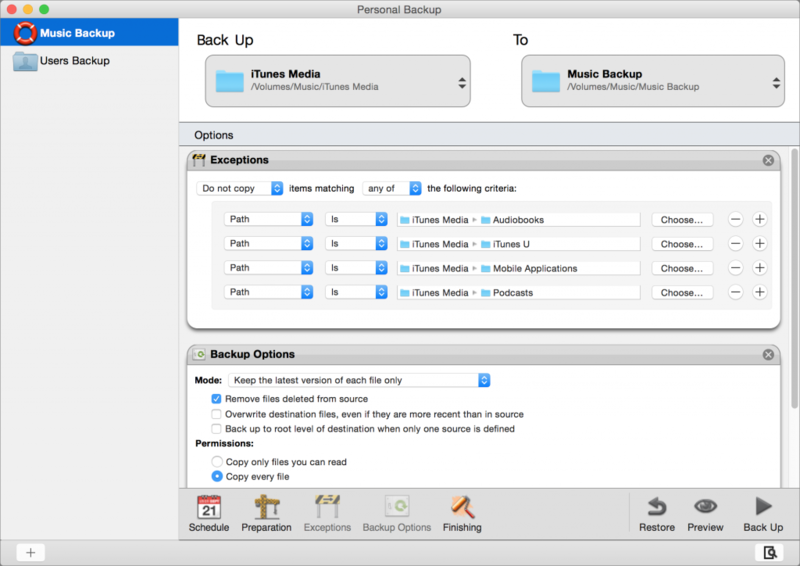 The second is to use dedicated backup software, such as Intego Personal Backup, which is available as part of Intego's Mac Premium Bundle X8. Personal Backup is easy to use, and you can exclude certain folders if you need to trim the size of your backups. I use Personal Backup and exclude a number of folders: Audiobooks, iTunes U, Mobile Applications, and Podcasts. I also have Personal Backup copy only the latest versions of my files, and delete any files from the backup that are no longer in the source. That way, may backups stay lithe and up to date. Each time you run Personal Backup, it only backs up files that are new or modified. So if you haven't changed anything in your iTunes library, Personal Backup checks and copies nothing. If you've added a few files, Personal Backup only backs up those files, leaving the rest of your existing backup intact. So while your first backup can take a long time, if you have a lot of media files, each subsequent backup is a lot quicker. 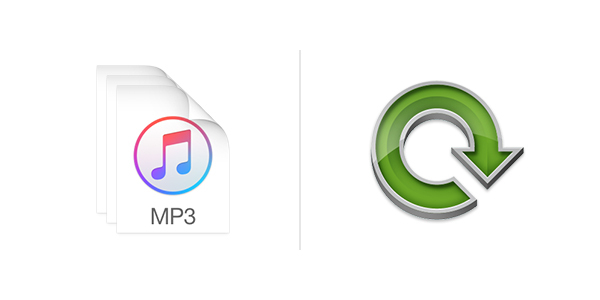 No matter which option you choose, make sure to back up your iTunes Media files. It would be a shame to lose all the music, movies, audiobooks, and other content you've bought or ripped. This entry was posted in How To and tagged backups, iTunes, iTunes Media, Mac. Bookmark the permalink.